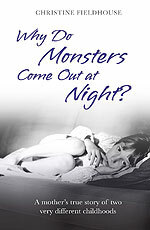 Why Do Monsters Come Out At Night? What is your book Monsters about? It's a story of two childhoods - my own, with my dad who was an alcoholic, and our son Jack's, which we think, and hope, is pretty carefree and fun. The past, which is harrowing and, at times, violent, contrasts really well with the present, which is happy, and easy-going. Why did you decide to write about your childhood? It was a spur of the moment decision which I made a few years ago when I was clearing out my mum's house after she died. As I emptied drawers, cupboards and wardrobes, I searched everywhere for a little note from my mum, with maybe a message for me, or a snippet about her life I hadn't known. I decided to start writing about my life so that one day, hopefully a long way in the future, when our son Jack rooted through my belongings, he'd find a little bundle of memories, which he'd sit down and read and maybe find something that would give him some comfort, or make him laugh. It also helped that Jack kept coming up with these sweet little questions about life that every mum hiding something dreads - and I would think: "If only you knew." I realised then the contrast was so strong it was worth writing about. Err, so you didn't leave it in a drawer for the next 40 years then? No, once I started writing, and the memories flooded back, I realised how far I'd come since those days as a scared, underconfident kid, and I knew then that sharing my story might help others in a similar situation. Also, as a journalist, I'd always wanted to write a book, but whenever I started writing fiction, I realised my own story was stronger than the one I was making up. So I sent my first three chapters and a synopsis off to an agent and she took me on. I was in shock for about a week and had to e-mail her to ask if I'd heard her correctly. Since then, I've sent a few e-mails like that. I must get my hearing tested or develop a bit more self-belief. Was Monsters a difficult book to write? Once I started writing, the memories seemed to pour onto my screen, and I couldn't type fast enough, with my two-finger typing. I think a lot of my memories had been locked away for a good 20 years, and writing released them. Over the years, I'd rarely talked about my dad and what it was like growing up with him as a father. Ironically, when it came to writing it all down, I had more problems remembering details about the recent stuff. Has writing about your childhood helped in any way? Yes, it's helped me accept and understand who I am and why I'm like it, and for the first time in my life I feel okay about myself. I've beaten myself up a lot over the years - for being too fat, too ugly, too thick, too boring, so it's nice to think hey, I'm OK after all, I'm a good wife and mum and I have a lovely life. You've been quite a private person until now. How do you feel about exposing so much of the past? I feel liberated. I'd kept some of those secrets inside me for so long. Now they're out there, I'm not worried what people think. Those who matter love me and understand. Part of me has worried about the accuracy of my memories from being very young - the book starts when I'm four so there will be things I have remembered incorrectly - but then I've reminded myself they're MY memories and the story is told through MY eyes. I know my brother Chris, who is almost nine years older than me, has very different memories of and feelings about some events. So is Monsters full of doom and gloom? On the contrary. In fact, there are some very funny moments in Monsters, and half the book is told from a very happy perspective. My objective in writing the story was to give people hope and inspiration, not to depress them. Of course, there are some scenes from the past, which people may find harrowing, but I hope my readers experience my determination to get through those times and that they have a laugh at the modern-day stuff. Monsters has been described as "a rollercoaster read" and I really hope if I make someone cry, I have them laughing again in a few pages.